LONDON and PARIS — British and French forces fired airborne and naval cruise missiles when they joined the U.S. in a strike against Syrian bases reported to be used for chemical warfare. British Tornadoes took off from an air base in Cyprus, French Rafales flew from air bases around France, while a French multimission frigate launched naval cruise missiles for the first time. France insists on a strategic autonomy in assessing and responding to threats. The French strike showed the importance of independent military intelligence in planning and executing a strike, analysts said. “Yes, military intelligence is an important step,” said Jean-Paul Palomeros, a military consultant and former French air chief of staff and former chief of NATO Allied Command Transformation. That capability to draw on a number of expert sources allows France to gather critical information independently, and identify each of the chemicals at those Syrian sites, he said. That capacity allows the French forces to plan the strike and then assess the damage. “There is enough information from the lessons learned to show the strikes were effective,” he said. There would have been two missiles per target to generate heat to destroy the chemicals and avoid a spread of their lethal effect. There has been criticism that it took so long for France to certifiy a naval version of the airborne Scalp cruise missile but the Syrian strike was a “good lesson” on how important it was to undergo a strict qualification procedure, Palomeros said. A French warship firing a long-range cruise missile brings France a deep strike capability previously reserved to the British Royal Navy and the U.S. Navy. That capacity is seen as strategic and would have needed a decision from the president, Emmanuel Macron, daily Le Monde reported. The French firing of its naval cruise missile for the first time allows industry to use a label of “combat proven,” seen as valuable in marketing weapons. The Rafales were escorted by Mirage fighter jets and supported by inflight refueling from C-135FR aircraft and spy planes with airborne warning and control systems. The air strikes showed a “continuity of policy” between London and France, which are “real allies,” said Jean-Pierre Maulny, deputy director of think-tank Institut des Relations Internationales et Stratégiques. The U.S. does not need the European allies in operational terms, but there is a “political weight in France and the U.K. taking part in the coalition,” he said. The military operation also brings France back into the political effort to find a resoluton in the Middle East. But there is a lack of consensus in the UN Security Council, with resistance from Russia and China, he added. The strikes also took place just before the inspection of the Organization for the Prohibition of Chemical Weapons (OPCW) to the Damascus suburb of Douma, where the chemical weapons were used last week, he added. “Dozens of men, women and children were massacred in Douma on Saturday 7 April using chemical weapons,” the French Elysée president’s office said in an April 14 statement. “The red line declared by France in May 2017 has been crossed,” the president’s office said. Russia had been informed beforehand of the strike, French Armed Forces Minister Florence Parly said. 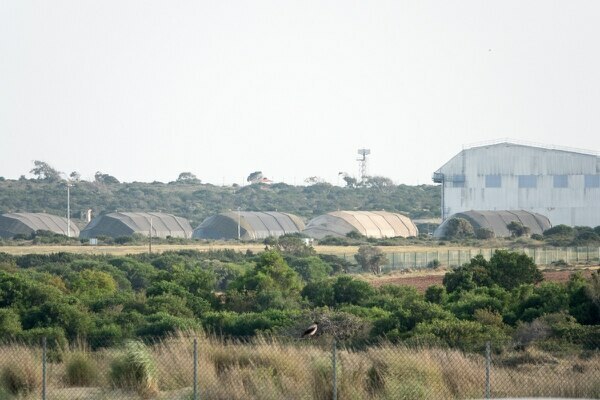 Four Royal Air Force Tornado GR4 jets operating out of the British base at Akrotiri, Cyprus, struck a Syrian chemical warfare storage facility with cruise missiles as its contribution to the joint action, the U.K. government said April 14. The strike jets launched MBDA built Storm Shadow cruise missiles against a former Syrian missile base 15 miles west of the city of Homs. The base is now thought to be used as a stockpile for chemical weapon precursors, the government said in a statement. Following the strike British Prime Minister Theresa May said she was “confident” that air strikes on the suspected chemical weapons facilities had been successful. “Detailed analysis of the effectiveness of the strike is currently underway, but initial indications are that the precision of the Storm Shadow weapons and meticulous target planning have resulted in a successful attack,” the government statement said. The RAF has been operating Tornado and Typhoon jets out of Akrotiri against targets of Islamic State in Iraq and the Levant in Syria and Iraq since the end of 2015. The International Institute for Strategic Studies said the RAF has eight Tornados and six Typhoon jets based in Cyprus. For the moment the Tornado GR4 is the only aircraft capable of firing the Storm Shadow missile, although work is underway to integrate the weapon on the Typhoon as the GR4 is due to be pensioned off by next year. Media reports said the Royal Navy has also moved a Type 45 anti-air destroyer closer to Cyprus to bolster the defences of the British base on the island. The British also operate a fleet of Reaper UAV’s from a base in the region providing reconnaissance and tactical strike capabilities. “The U.K. Type-45 destroyer HMS Duncan is currently in the Eastern Mediterranean as the flagship of NATO’s Standing Maritime Group 2. Although she is not equipped for land-attack missions, she may still be diverted to the theatre in order to bolster the air-defense capability of any task group (and indeed RAF Akrotiri) against potential reprisals,” said IISS analysts earlier this week. Other media reports also said the Royal Navy were moving a cruise missile armed nuclear submarine within range of potential Syrian targets. The decision to join the US and France in the attack on the chemical warfare facilities without the endorsement of Parliament has been criticized by some British politicians. May said she would make a statement to parliament on Monday and give lawmakers the opportunity to quiz the government on the decision. The government does not have a legal requirement to consult parliament on military actions of the sort undertaken earlier today, but it has become the convention. In 2013 the David Cameron government lost a parliamentary vote to attack the Assad regime after a chemical attack near Damascus.